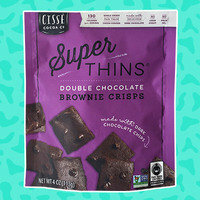 I love anything chocolate, and I keep seeing thin, crispy brownie products on shelves. There are so many brands, I don't know which one to buy! Any insights? These treats are really sweet and totally enjoyable! They earn brownie points (tee-hee!) because they're made with non-GMO ingredients and pretty easy to track down: They can be found at Walmart and Kroger locations and can also be purchased online. BTW, Snack Factory also makes Dessert Thins in Chocolate Chip and Lemon Tart. The Chocolate Chip variety is the best thing ever! Tate's take on the trend is our hands-down favorite! 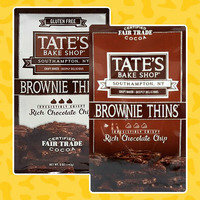 These crisps have the most rich and buttery taste, and are made with certified fair trade cocoa. Plus, they come in a gluten-free version! Click to see where they're sold, or just order 'em online. I love a LOT of what TJ's offers (see here, here, and here for proof), but these crispy treats weren't my favorite. They don't have a lot of flavor, and they're not as rich and chocolatey as some of the others. But they ARE vegan-friendly and gluten-free, with only 100 calories per serving, so they have a lot going for 'em! Find these at Trader Joe's and on Amazon. Okay, this product is one of my favorites in its category. I like that you get about 9 pieces per serving, as opposed to 3 - 4 larger ones. And they are SO chocolatey! The line includes several other flavors: Cherry & Sea Salt (AMAZING), Coconut Cashew, and Cranberry Pepita. The ingredients are fair trade certified, and there's no corn syrup or palm oil in sight. Impressive! Click to find, or order online. Another favorite! 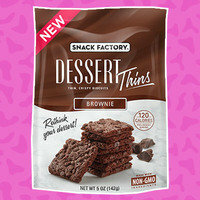 The chocolate flavor of these cookie-shaped brownie thins is off the charts. Plus, they're non-GMO; free of artificial flavors, colors, and preservatives; and made with simple ingredients. The serving size is nice, the taste is buttery and delicious, and you can find these things everywhere! P.S. 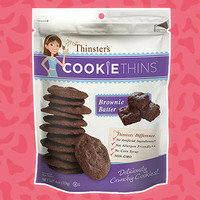 There are loads of other flavors in the Cookie Thins lineup. I'm pretty sure Sheila was the FIRST to offer crispy brownie snacks (go, Sheila! ), but I was a tiny bit surprised to find that these aren't quite as chocolatey as some of the others. 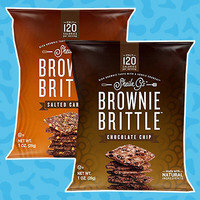 However, I LOVE that Brownie Brittle is available in portion-controlled packs! It comes in a slew of fantastic flavors (Salted Caramel, Peanut Butter Chip, and more! ), and there's even an organic line. Click to find out where to buy Sheila's goodies. They're also available online. 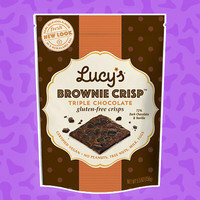 Love, love, love Lucy's crunchy brownie-like treats! They feature a combination of dark chocolate chunks and big chocolate chips, and they are super chocolatey. These crisps are gluten-free, vegan, non-GMO, kosher... The list goes on and on! Find 'em at Home Goods, Whole Foods, and other select retailers. Definitely worth seeking out or ordering online. There you have it! BTW, while some of these are more chocolatey than others, they're all FANTASTIC alternatives to big fatty brownies. 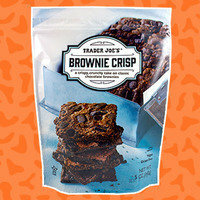 So let the crispy brownie chewing commence! Today, April 26th, is National Pretzel Day. Shout out to Snack Factory's original crispy treat: Pretzel Crisps! Don't let your friends make bad brownie decisions. Share today's email by clicking "Send to a Friend!"